I was a speaker at the TEDx event at Hong Kong Polytechnic University on March 10, 2018. The theme was “Unscripted”, and I spoke about improv and my concept of “The Playground of Possibilities”. I also performed a 16-minute improv set with two of my improv friends, Christopher Coleman and Namrata Bindra (we called ourselves TEDxcellent Improv). Here's the video of that. Here's Part 4 in my series of blog posts about improv, applied improvisation and related topics, with a lengthy list of lots of useful resources. Here's my blog post about the book "Creativity, Inc." by Ed Catmull of Pixar Animation. It seems to me that much of what he writes about creativity and the Pixar culture is actually about approaching things with an improvisational mindset. I presented a 90-minute experiential workshop (twice!) 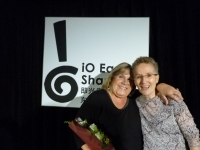 at the international conference of the Applied Improvisation Network in Montreal, Canada, September 24-27, 2015. The title of my workshop was “Life is a Playground of Possibilities – Improvising More Resourceful, Joyful Ways of Being”. At this evening of photography, theatre, poetry, music and storytelling, presented by the Global Institute For Tomorrow Foundation, I performed some improvised storytelling (with audience participation). Tuesday September 15, 2015 at Orange Peel, Central. On July 12-13, 2012, I attended the "Thriving in Uncertainty" conference in Melbourne, Australia, about using improv in corporate training. Then on July 16, 2012, I co-taught a one-day workshop about improvisation for acting and directing students at Toi Whakaari, New Zealand's national drama school, in Wellington. My fellow teacher was Andrew McMasters from Seattle, Washington, USA. Here's my blog post about the conference. 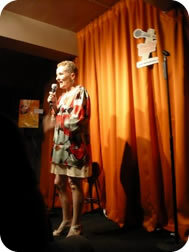 I told a true story from my life at "The Campfire" storytelling show on Thursday July 5, 2012, at the TakeOut Comedy Club Hong Kong. Here's the video (6m 23s). 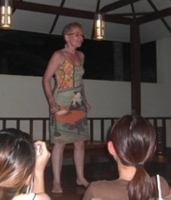 On May 24, 2012, I participated in some improvised fun at the TEDx MongKok event here in Hong Kong. The theme of the day was Chaos, so here's a video of a short talk by Professor Kay Ottik (i.e., me!) about Chaos. Check out a YouTube video (2m 55s) of me performing a comic monologue that I wrote myself. Are you a performer? And do you want to know how to get media coverage for your next show? Listen to my series of FREE audio interviews with three Hong Kong journalists, who share their insiders' tips. "Thank you so much for the stand-up comedy performance, it was very entertaining and make the dining gathering more merrier." 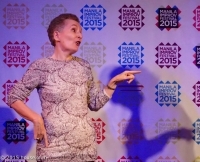 Do you need an actor, improviser, Applied Improvisation trainer, MC, guest speaker, storyteller or publicist for your play, film, commercial, party, corporate training programme, video, conference, PR event...? Call me! 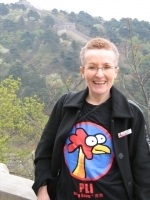 I'm Kay Ross in Hong Kong, and I LOVE watching, participating in, teaching and marketing the performing arts. Check out my performing arts CV and my fab photo gallery, then contact me today if you need my services. 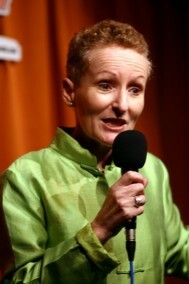 As a teenager in Adelaide, Australia, I was a member of a youth theatre group called The Saturday Company for four years; sang in the choir and performed in theatre productions at Adelaide Girls' High School, and sang in the choir and studied Drama (history, theory and performance) for one year at Adelaide University. When I was based in Edinburgh, Scotland, from August 1979 to October 1980, I performed in some amateur theatre productions, including one in the 1980 Fringe Festival. In Hong Kong, I've been involved in lots of shows with the Hong Kong Players, Hong Kong Singers, American Community Theater, Kassia Women's Choir and other groups - I've performed onstage and/or helped with publicity or stage management. I've also done some professional acting gigs: I was an extra in a local feature film; played Margaret Thatcher in a TV commercial; appeared as Mrs Santa Claus in a Christmas promotion in several shopping-malls; was a story-teller for local kindergarten students; and acted in an online promotional video for a group of Hong Kong hotels. I also speak French, so I've performed many roles as a cheeky French maid. Ooh la la! I devised, directed and performed in some improvised stunts as part of the TEDxMongKok event in Hong Kong on May 24, 2012. The theme of the day was “Chaos”. In the morning, we had a group of actors playing various characters, interacting with the delegates. Then in the afternoon, we presented a fake but very believable TED talk about chaos by "Professor Kay Ottik" (me!). Here's the 6-minute video. On March 10, 2018, with my friends Christopher Coleman and Namrata Bindra, I performed in an improv set as part of the TEDxHKPolyU event at the Hong Kong Polytechnic University. The theme of the whole event was “Unscripted”, and we called ourselves TEDxcellent Improv. Here’s the video (16m 5s). 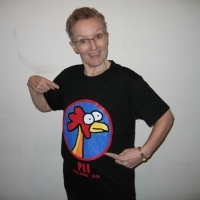 I’m a member of People's Liberation Improv (PLI), an English-language comedy improvisation troupe founded in 2008 and based in Hong Kong. We perform comedy improv shows - usually once a month - featuring unscripted, improvised-on-the-spot scenes inspired by suggestions from you, the audience (think “Whose Line is it Anyway?”). Not suitable for children. 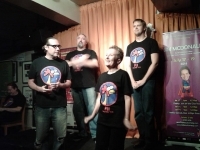 We’ve performed at many venues in Hong Kong, and at improv festivals in Hong Kong, Manila, Shanghai, Beijing and Seoul. “Applied Improvisation” means taking the principles, skills and mindset of improv offstage, and applying them in life and work. And they absolutely do apply, because like improv, life and business don't come with a script! 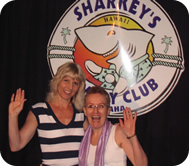 So I offer tailor-made training workshops for corporate clients, universities and community groups, giving them a fun, hands-on, practical and immediately applicable experience of approaching life and work in an improvisational way. Not your typical training lecture with PowerPoint slides! And don’t panic - it’s not about performing or being funny, and no acting or improv experience is required. Why hire me to lead a workshop? Because you and your team will build your skills in leadership, teamwork, communication, public speaking, emotional intelligence, creativity, innovation, experimentation, intelligent risk-taking, trust, presence, resilience, resourcefulness, nimble responsiveness to change and the unexpected... And because of that, you and your organisation will thrive in a volatile, uncertain, complex and ambiguous world. Since June 2011 I’ve given many talks and led or co-led many public and private workshops in Hong Kong; Kuala Lumpur, Malaysia; Bangkok, Thailand, and Wellington, New Zealand. Clients have included a global hotel company, a global insurance company, universities, a global data analytics company, a company that manages serviced apartments around Asia, New Zealand's national drama school, a department of the Hong Kong Government that focuses on innovation, a company that runs musical-theatre summer camps for children, a branding/graphic design firm, a bank, business networking organisations, non-profit organisations... Participants have included teenagers and adults. 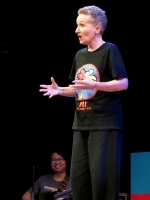 I gave two presentations at the regional conference of the international Applied Improvisation Network in Manila, the Philippines, in July 2013. The sessions were titled “Making the Case for Applied Improv”, about how companies and organisations around the world are using applied improvisation, and “How to Sell an Applied Improv Program”, about how to make a convincing case to potential clients. Combining my skills and interest in improv and personal development, I presented a workshop (twice), titled “Life is a Playground of Possibilities: Improvising More Resourceful, Joyful Ways of Being”, at the international conference of the Applied Improvisation Network near Montreal, Canada (September 2015). I've also presented the same workshop, as a public event, in Hong Kong (April 2016 and November 2017) and Darwin, Australia (May 2016). 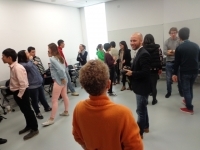 I also organised and promoted a public workshop, “The Wisdom of Play”, led by visiting American improviser and trainer Gary Schwartz in Hong Kong (March 2014). So what qualifies me to be an Applied Improvisation trainer? I've been an actor since I was teenager, I studied Drama for one year at university, I performed stand-up comedy for four years, and I've performed with Hong Kong-based English-language improv troupe People’s Liberation Improv since March 2008. I’m a member of the international Applied Improvisation Network. I’ve attended regional and global conferences of the Applied Improvisation Network in Melbourne, Australia; Manila, the Philippines; Berlin, Germany; and Montreal, Canada. I’m also a Marketing Consultant, Editor and Copywriter, so I understand business. I have over 20 years’ experience designing and presenting corporate training workshops about marketing, copywriting, PR, social media and the concept of “Content Marketing” (i.e., using storytelling and emotions in marketing material). I’ve also attended many workshops about such topics as personal development, emotional intelligence, bodywork, healing, public speaking, entrepreneurship, marketing, communication, psychology, training, facilitation, coaching and storytelling. "Creativity and Improvisation" - about the book "Creativity, Inc." by Ed Catmull of Pixar Animation. It seems to me that much of what he writes about creativity and the Pixar culture is actually about approaching things with an improvisational mindset. So if you’d like me to show you and your team how to approach life and business with an improvisational mindset, contact me. 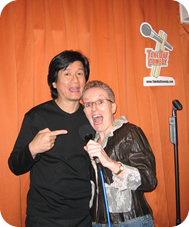 From February 2007 to July 2011, I regularly performed my own original stand-up comedy material at the TakeOut Comedy Club, Hong Kong’s (and Asia’s) only full-time, dedicated comedy venue. 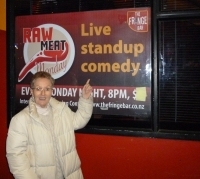 For a taste of my stand-up style, check out this YouTube video of my performance at the late-night show at the Club on Valentine's Day, February 14, 2009 (thanks to cameraman James Foreman). I’ve also performed stand-up comedy at other venues and events in Hong Kong; New York City; Honolulu, Hawaii; Tucson, Arizona; Wellington, New Zealand; Bali, Indonesia; Pune, India; and Mumbai, India. I present public training seminars about marketing and media relations that are particularly popular with visual and performing artists and arts organisations. I used to be the Listings Editor at the South China Morning Post newspaper - for six years I compiled the daily listings of what was on around town (e.g., performing and visual arts shows, arthouse films, community events etc.). So I know what journalists want and need. I’ve written or edited all sorts of marketing communications material about the performing and visual arts. I edit the English-language publicity blurb about the shows and events at the Hong Kong Fringe Club, our leading alternative arts venue. I’ve done lots of paid or volunteer work on marketing campaigns for performing arts shows and events - I was the professional publicist for the 1986 Adelaide Fringe Festival, and have helped with marketing and front-of-house duties for many shows in Hong Kong. Watching and performing in shows helps me to understand human psychology and behaviour (and that helps me with my healing work too). So if you're looking for someone with my unique combination of talents, please contact me today.